I’ve been thinking a lot about writing lately. Notice, thinking, not writing. One can think anywhere at any time: driving the car, tossing and turning in the dark at night, walking the dogs, or jogging on the treadmill. One does not have the same freedom in writing. I could list a million excuses, which only a few are really valid, for not spending enough time writing. But quite simply, I have not been spending enough time with pen in hand. I do sit in front of the computer often, but that usually spirals out of control and I get lost in the vortex of the worldwide web universe, and lose two hours of my life in the blink of an eye. Quite ridiculous, but I have to leave the house if I want to accomplish any writing during the day. So I came up with a brilliant plan. This week is spring break, and it is time to change up the routine. I have two coffee shops I frequent regularly. At one, I am friendly, know all the workers, half of the customers, and regularly talk to strangers. As you can imagine, it is rather like working at home! At the other coffee shop I am very self-contained. I don’t make conversation with the baristas, I don’t chat with the person sitting at the table next to me, I don’t even make eye contact with anyone. I get a lot of work done here. So I thought about all of the places I could go to write where a cup of coffee is also available (a requisite for this writer). The first venue on my list was the Milwaukee Public Museum, which also happens to have a free day for Milwaukee County residents. I am very comfortable in this museum: I’ve been visiting it since I was a very young child and my father donated the fossils that we found along Lake Michigan and are now on display in the Paleozoic diorama. So the museum is an old friend. I took the escalator to the third floor – I figured the school groups wouldn’t be that far up yet, and I was right. In the back corner of the third floor is a stairway that leads up to floor 3 ½. It’s kind of a secret floor because it is rather out of the way, and there are never crowds there. It is also houses my favorite displays. When I went to college (the first time around) I planned on becoming an archaeologist. My junior year I found out that archaeologists generally have to continue on in school until they have their Ph D, and when they went on digs in the jungle they slept in tents and were subject to whatever insects might be crawling around in that particular locale. I added an English and a History major, and graduated with three majors and the ability to make great cocktail conversation. As a budding archaeologist, my area of focus was Mesoamerica, and this is what is displayed on floor 3 ½ of the museum. There are life size dioramas of cenotes filled with offerings, gold discs engraved with the scenes of hearts being cut from the enemy’s writhing chest and offered to the gods, and miniature replicas of the incredible buildings, ball courts, and pyramids built by the pre-Columbian societies that flourished before the Spanish colonization of the Americas. I found a bench in front of the Nazca Culture and the Tiahuanaco Influence displays. While I sat for an hour, only a couple families and one day care group trouped past. It wasn’t quiet, however. The museum also has sound effects for its displays, so there were birds shrieking and wood flutes weaving sweet, rich, and deep between the bird calls. Further off, I could hear the mariachi band playing in the village square on market day. The noise was a nice background, and I spent an hour writing in my notebook. Ten thirty rolled around and I still hadn’t had a cup of coffee, however, so I headed down. 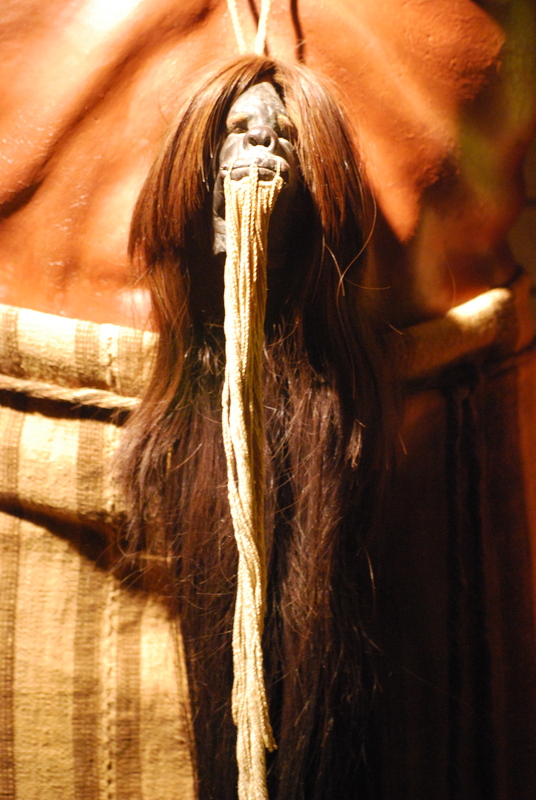 I swung by the shrunken heads exhibit on the second floor because it is fascinating in all respects, and then jumped back on the escalator to the first floor. There is a small coffee kiosk in the lobby which serves Stone Creek Coffee, a local business. I ordered my usual drink of choice, a large latte. It was not a latte that I would go back for. It was made with French Roast beans, of which I am not fond, but will drink in a bind. I took my coffee and gear and went out to the garden room, which is simply a glassed-in room next to the garden at the entrance of the museum. The light was nice. No wifi. I can live without it, but it would have been nice to take a quick peak at my email. The school groups started filing in for an early lunch. I can ignore most distractions, but the kids reminded me too much of work! At noon, I packed up my gear and headed home. The museum was a nice place to visit, but I decided it would not make my list of venues where I can write. Strikes against: lights too low in the exhibit halls to write comfortably, you can’t eat or drink in exhibit halls, not my cup of choice for coffee, parking was $3.00 for every two hours, uncomfortable café, no wifi – but that’s probably a good thing!. I’ll be visiting a new venue tomorrow. ← Spring is here (sort of) along with………Once Upon A Time! I sympathise with you, it sounds so familiar: the thinking about writing rather than the writing itself, the delaying tactics, the excuses. At least you were very inspired by the places you visited and that’s probably the way to approach it: have a coffee somewhere and bring you laptop or notebook. Lots of books are written that way I think. Hope it works out for you! Nowadays I am happy when I manage to write a blog post – the writing will have to wait until I retire I think! Let us know what turns out to be the best / most inspiring venue ..
Hi Sea so nice to hear from you! I’ve been following your Singapore saga and the e-reader addiction, disaster, and revival! Oh my!! You know, I think Harry Potter was first written on napkins in a coffee shop… who knows? I even bought a tiny little tape recorder and recorded all kinds of great thoughts while on a couple long driving trips. Now all I have to do is listen and dictate…..
Retirement is looking pretty darn good to me right now. I wish I could afford it! Oh, this is fun — reading you backwards and coming to discover how YOU discovered all these wonderful spots. I have to say I love going to the museum so much, I don’t think I could possibly write there. It wouldn’t be the sounds or the children that distracted me — it would be wanting to take a look at this thing or that — and while it might inspire me, I’m not sure I could get it down on paper! But it looks like a wonderful spot to visit. I loved that blue — jeep? Truck, maybe? It all looks wonderful and you are on a grand journey — and one thing is for sure. I’m not sure if you are writing your “real writing” but I’m thrilled you are writing your blog! I guess I had to come to the conclusion that it is all real, or I would go crazy! 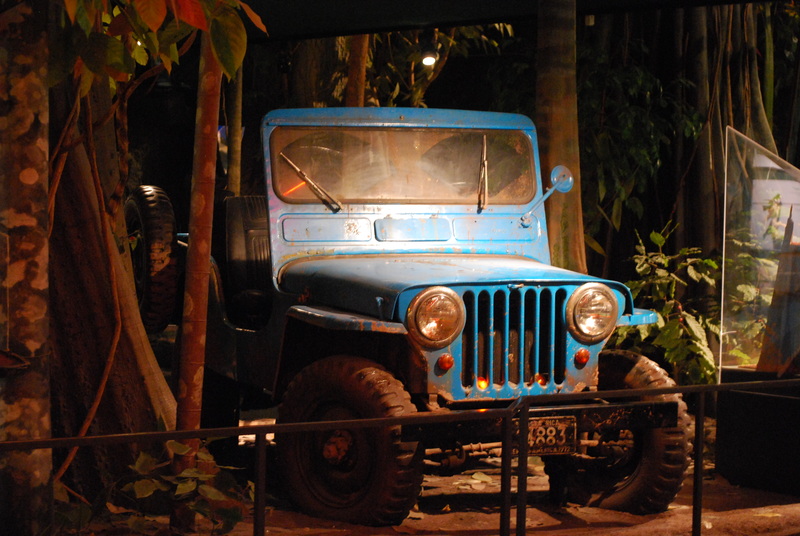 The blue jeep is parked in the “jungle” of Costa Rica where the biologists from the Milwaukee Public Museum have done quite a bit of study. This is a wonderful display. Another must for your visit here! So many things to see, you should probably come back for Irish Fest in August to fit it all in!! Thanks for stopping by here and encouraging me.